The Apple Watch wasn’t the only star of Apple’s “Spring Forward” event Monday. In addition to showing off the smartwatch, the company announced a new MacBook and talked a little bit about the Apple TV. The new Macbook comes in at 2 pounds, making it the lightest Mac Apple has made. It’s also the thinnest, measuring in at 13.1mm at its thickest point -- 24 percent thinner than the 11-inch MacBook Air. The laptop has a 12-inch Retina display, and is the first fanless MacBook, allowing the logic board to be 67 percent smaller. It’s powered by an Intel Core M processor and has new contoured batteries that fit the casing for the laptop, providing up to nine hours of battery power while you’re surfing the web. Related: A Way to Waterproof Your iPhone? Apple Is Looking Into It. Apple was able to integrate the antennas into the laptop’s enclosure, allowing the computer to have a full metal enclosure. The laptop also has a more precise keyboard and a new backlight system with individual LEDs for each key. The trackpad on the laptop is also getting an update. It can be adjusted for the softer feel, and is pressure sensitive, so it can be used to add new features to the computer. For instance, now if you push down on the trackpad while watch a video you can fast forward a video. push harder, and the video will go faster. And get this: The laptop uses a new connector called USB-C. It’s a versatile connector that can be used for power, as well as HDMI, DisplayPort, HDMI and VGA capabilities. Apple says it will be a new industry standard, so you’ll see it pop up on other products. 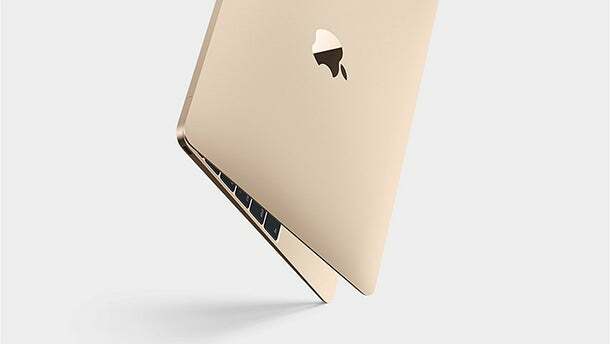 The new MacBook comes in silver, space gray and gold. It starts at $1,299, and will begin shipping on April 10th. It joins the original MacBook Air, which is getting an updated processor and faster Thunderbolt, shipping today. The MacBook Pro is also getting faster processors and the new pressure-sensitive trackpad from the new Air. It is also shipping today. Meanwhile, Apple TV saw a price drop at the event. Now you can buy the media streamer for $69 rather than $99. There’s also more to stream. HBO announced that its standalone streaming service HBO Now will be available exclusively on Apple devices when it launches next months. That means you’ll be able to watch the premiere of game of Thrones on your Apple TV, iPhone or iPad.